Ageing satellite dishes, once the backbone of Africa’s telecommunications system, are being given a new lease of life as radio telescopes. The thrifty project aims to boost the skills of the continent’s scientists as Africa prepares to host the US$2.1 billion Square Kilometre Array (SKA), set to be the world’s most powerful radio telescope when it is completed in the mid-2020s. In May, the SKA project leaders decided that Africa, with South Africa at the helm, would split the array with Australia and New Zealand . The SKA will detect radiation from the early Universe, giving clues to how the first stars and galaxies formed. 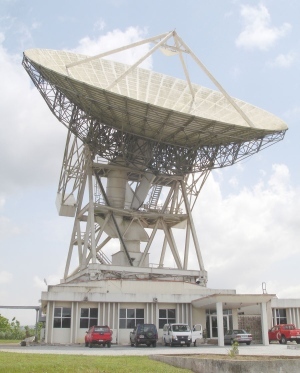 This antenna in Kuntunse, Ghana, is in line for an upgrade. The Congress of South African Trade Unions in the North West is embarking on protest action against Sun City, Sun International’s most prestigious resort in South Africa. The protest action is prompted by the inhumane manner in which Sun City continues to treat its workers and guests who are black, in particular Indians and Africans. Sun City has been collecting workers’ gratuities for the past fifteen years and has failed to transfer the money to the workers; it continues to accumulate interest in an account controlled by Sun City and workers do not have a say in that money. é impossível perceber a tragédia de Marikana sem avaliar como as corporações mineiras, sentadas sobre mais de 80% dos recursos mundiais de platina, criaram «uma comunidade de pobreza desesperada e tensões divisionistas». E sem compreender como a ganância das corporações, cujo único objectivo é o lucro, «tentou enfraquecer um sindicato estabelecido e a negociação colectiva em conivência com forças demagógicas». Há, pois, muitas lições a tirar da tragédia de Marikana. O ANC e seus aliados – portadores de um património de luta inigualável e inspirados pelos exemplos de heróis como Nelson Mandela e de outros patriotas – terão de estar à altura de responder aos desafios colocados e prosseguir a construção de uma África do Sul pacífica, democrática e progressista. Indeed the above also requires that we undertake a serious analysis of some of the threats facing the working class in general and the progressive trade union movement in particular. This incident, as well as others before it in the recent period, should send a very clear message that there is a sustained attack and offensive against COSATU in particular. The SACP has also correctly warned that where our detractors and enemies sense some divisions amongst our ranks, then they always tend to go on the offensive. It might as well be important that these and other related matters needs to be discussed at the COSATU Congress next month, including frank analyses of the strengths and weaknesses of COSATU affiliates as well as some of the threats facing the federation as a whole. This discussion must not take the form of a lamentation or rhetoric, but must aim at concretely coming up with a programme to defend and strengthen COSATU, within the context of deepening the unity of our Alliance. Such a discussion at COSATU Congress must also concretely explore the possible relationship between, Marikana, the current global capitalist crisis, the further decline in the profitability of capitalism, and a renewed offensive to weaken the working class to defend declining levels of profits. For example to what extent are the tensions in the platinum mine-belt connected to the decreasing demand of platinum in an economic zone like the EU which is a major consumer of platinum for catalytic converters?